The last day at sea was a bit of a disappointment. The weather did not cooperate with us at all and it was quite chilly. It just meant that we had to find a quiet corner out of the wind and stick our noses into a book. In addition to reading, we did manage to time for a great pizza lunch, followed by my being dragged down to play Bingo, of all things. As usual, we didn’t win but one lucky cruiser walked away with $1750. Karen also took in a line dancing class which she said was lots of fun. Supper tonight was at the Crown Grill and OMG, the food was unbelievable and it kept coming and coming. I think we all had steak and lobster with all the trimmings. I am afraid we put on a few pounds with that meal. Finally, the disembarkation process…something I don’t like about cruising. The good news was it was highly efficient and without too much waiting. It was probably the quickest we have ever gotten off a ship…kudos to Princess for that. 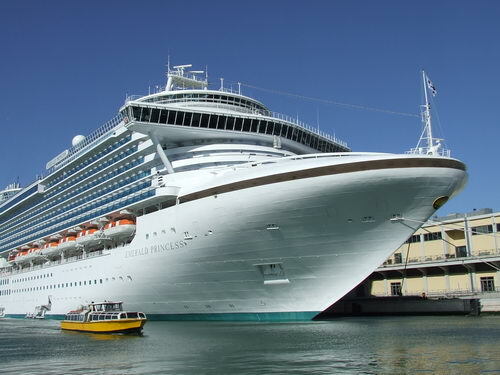 All in all, we had an exceptional time and can highly recommend the Emerald Princess for any prospective cruisers. If you have any questions, don’t hesitate to call one of our knowledgeable agents and we would be happy to help plan your perfect cruise. This is an island that we have never been to and so we were full of anticipation. The dock facilities are very new and well designed. There are lots of shops at the pier and a huge Margaritaville complete with pool area. There are beaches on either side of the pier with many, many beach chairs. Some light snorkelling is available there as well. That’s the good news. Otherwise, Grand Turk has very little to offer. We paid $25 each for an Island Tour (not through the ship) and were jammed into a 10 year old Toyota van that had seen better days. There were 10 passengers in the vehicle and though the driver was certainly knowledgeable and nice, there is precious little to see on the island. My suggestion would be to book the Chukka Buggy tour through the ship. However, you need to do that early as when we tried to book it 3 months ago, it had already sold out. Otherwise, there is apparently very good snorkelling and diving around the island. So, like the majority of the ship’s passengers, we hung out at Margaritaville and the beach. Tonight was the last production show by the Princess singers and dancers and it was the best we had seen all week. I would certainly recommend taking in the show. By now, we have all gained several pounds, even though we have tried to watch what we eat and get to the gym. We have also refused to take an elevator, choosing instead to climb the stairs whenever necessary…just a small tip to help keep the weight off. Known as the shopping Mecca of the Caribbean, there are literally hundreds of jewellery stores lining the streets of the main town, Charlotte Amalie. For those not wanting jewellery, not to worry, there are also many perfume stores, duty free liquor shops (how about $6 for a litre of rum?) and assorted other tourist shops. If you are looking for tee shirts, hats, sun dresses, knock off purses and the like, I’d recommend the market which is easy to get to right on Waterfront Highway. Tee shirts 5 for $10 are common and the prices are pretty standard across the board. There were only 2 ships in port but can accommodate up to 9 ships on any given day. I can’t imagine how busy that would be. Our main focus however, was not shopping but rather to get to Magen’s Bay which is rated one of the top 10 beaches in the world. The taxi fare was $9.00USD each to get us there, up over the hills and down to a fantastic beach. It also costs $4USD each to get into the area but truly worth every penny. The beach is long with white powder sand that highlights the incredible turquoise water. The beach is quite gradual and even non-swimmers can frolic in the warm water. It is a spectacular way to spend your day. At this point I should warn that the Caribbean sun is quite intense and for those of us that were not liberal with the sunscreen were feeling the pain of a sunburn after even just a couple of hours in the sun. It is quite comical to walk down the beach and see the many shades of red and the patchiness of sunburns for those that did not take care how they applied their sunscreen. The area has good washroom facilities and a bar/restaurant that was adequate for a beach day. There is lots of shade and several picnic benches. Our driver met us back at the beach at our appointed hour and after a couple of photo opportunities left us downtown so we could do our shopping. It is about a 10 minute taxi ride ($4.00 each) back to the ship and there were lots and lots of taxis available. We decided not to take a ship’s tour today and wanted to find our own tour on shore. We didn’t have to go far as there were many taxis and tour companies right at the end of the pier. We decided on a circle island tour with a company called Preferred Tours and Transfers and we had the pleasure of being assigned Perla Rombley as our driver. Perla made our day! She was one of the happiest people I have met and had a wealth of knowledge. The tour was $30USD per person and since there were 6 of us, we had the van to ourselves. We made the regular photo stops but she really wanted to personalize the tour and so she took us to a little beach right at the end of the airport. It was a lovely spot and quite popular because the planes come in for landing right over your head. The beach bar even had a surfboard with a sign that showed all the incoming flights and times. Off to another beach, for a quick dip. This one even nicer than the first, because Perla wanted to show us nicer and better beaches. These were all on the Caribbean side but she promised that we would go to a beach on the Atlantic side that was the most popular. Early in the day, we experienced a bit of a traffic jam because the “drawbridge” had to let a large sailboat through. Perla jumped out of the van, saying “I’ll be right back” and ran over to a grocery store only to come back with a Caribe beer for each of us to enjoy. We made our way from the Dutch side of the island over to the French side of the island for lunch at one of Perla’s favourite restaurants. The restaurant was very local, food was good and reasonably priced ($30USD for 2 including beer). Touring around the island, Perla talked about the island culture, etc on our way to Orient Beach. A beautiful beach but be warned, there is a section of the beach that is clothing optional and with an “au natural” following, there was very little clothing to be seen. It truly was a great day on St Maarten made special by our guide. If you are ever on St Maarten, let her know and she will show you a wonderful time. Her email address is caribe_pearl@yahoo.com. This is always a day that we look forward to. It’s nice to just relax and enjoy the gentle motion of the ship and do what you want, when you want. The wireless service on board is pretty good, it is a little slow to what we are used to. The price ranges from $.75 per minute to less than $.50 per minute depending upon the package that you buy. It is nice that we have it in our room and don’t have to go to the Internet Café or a public area. After a morning of catching up on emails and writing this blog, it was time to explore the ship a bit more and put my nose into a book. Quite a windy day and after a while, we decided to go to the cabin and our deck was perfect…out of the wind and with sunshine. There are real advantages to opting for a stateroom with a balcony. We tend to spend quite a bit of time out there watching the world go by and often enjoy room service there. There are many, many activities on board from lectures, dance lessons, demonstrations to my favourite…wine tasting. That’s where we headed off this afternoon to taste 6 premium wines including the famous Opus 1. The cost was $25 per person but well worth it since the wines were of better quality and we had some wonderful canapés to go with the wines. Good explanations by the wine stewards went with every wine. The balance of the day was spent enjoying life at sea and getting ready for the Formal night (one of 2 during the week). This was the Captain’s champagne waterfall with complimentary champagne. We discovered the Wine Bar before dinner and enjoyed a nice glass of wine with complimentary sushi and tapas before dinner in one of the dining rooms. The Anytime Dining is working very well and we have yet to wait any more than 10 minutes before getting in. The show tonight was a tribute to Motown and was quite well done. A typical cruise style production and a nice way to end the evening. A great little spot in the Bahamas, this is Princess Cruise Lines, own little piece of Paradise. We had rented a Cabana when we reviewed all the shore excursions on line (something you really want to do because often shore excursions sell out). The Cabana was a small little “cabin” that had a table and chairs for 6 and it was air conditioned if needed. This is on a quieter part of the beach, so if you want be in the action zone, I wouldn’t recommend it. There were several bars set up along the beach and always lots of wait staff catering to your needs. The BBQ lunch was quite good with hamburgers, sausages, ribs and chicken and lots of fruit. You can imagine feeding 3,000 for lunch on the beach, so there were some line ups. For those that wanted, you could rent snorkel gear, kayaks, peddle boats, sail boats, etc. It was a wonderful day to unwind and a great way to start your cruise. After our day at the beach, we decided to check out the gym facilities and found them extensive…lots of treadmills, elliptical machines, weights and weight machines and there were many classes that you could sign up for (for an extra charge). It’s a busy place but we had no problem finding a machine to use. For supper, we had made reservations at Sabatinis which is an Italian specialty restaurant. There is an extra charge of $20 per person but the meal was fantastic and the staff we extremely friendly and very attentive. We all thought the extra charge was worth it. But a caution, you will be extremely full after the many, many courses and don’t miss the Tiramisu…it is very decadent. A note – we purchased some wine in Ft Lauderdale to have with our meals. Princess allows each passenger to bring 1 bottle of wine on board and they only charge a $15/bottle corkage fee. We thought this would be a great way to have some nice wines at a more reasonable cost. What we found was that the prices of the wines on board are very reasonable and they have a pretty good list. We still saved a few bucks but honestly, I would just buy the wine on board next time. After a long day of travel (yesterday) it was good to not to be worried about missing the ship. The hotel we chose (and there was not too much to choose from as Sunday was Super Bowl) was the Best Western Orchard Park Inn. We were pleasantly surprised at the quality and cleanliness of the hotel although about 7 miles from the Cruise Terminal. The only issue we had was that the shuttle bus that we had booked never showed up and after some scrambling and about an hour and a half wait, a substitute bus appeared. We still made it to the ship in plenty of time but the good news was that we literally walked onto the ship with no waiting at all. For those of you that have cruised before, the embarkation line ups can be quite long. Settling into our cabin (Caribe Deck, 709), we found the stateroom to be quite spacious and the balcony was very big. Certainly we could easily accommodate our little group of 6 on the balcony for a sail away toast. 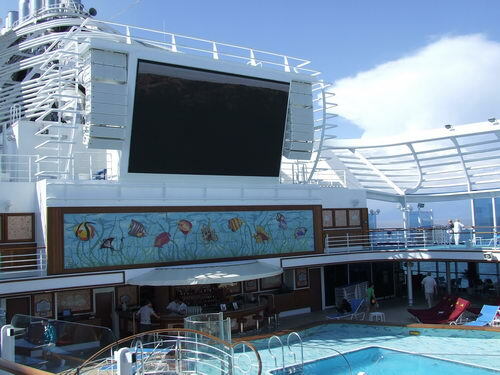 As it was Super Bowl Sunday, we joined the crowd of fans out on deck where this ship has a huge screen and they have deck chairs lined up on 3 decks so we had a great venue to watch the Saints march to victory. Lots of beverages , popcorn and all the food you could want to watch the game. Unfortunately the evening was very cool but Princess had some great flannel blankets. Supper in the dining room was excellent with lots of choices and we were not disappointed. We chose the Anytime Dining option which allows us to go into 2 of the 3 dining rooms whenever we want. If there is not a table available immediately, they give you a pager to let you know when it is ready.